Published: Oct. 21, 2018 at 02:56 p.m. Updated: Oct. 22, 2018 at 11:56 p.m. The Denver Broncos kicked off Week 7 with a dominating win against the Arizona Cardinals, the Patriots shut down a Hail Mary for a win in the Windy City, and the Rams remain undefeated. Check out the best photos from Week 7. 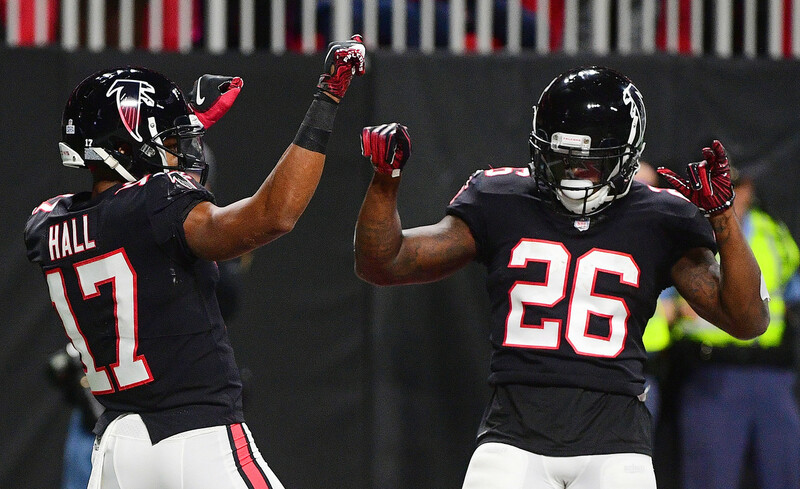 Atlanta Falcons wide receiver Marvin Hall (17) celebrates his touchdown with Atlanta Falcons running back Tevin Coleman during the first half of an NFL football game against the New York Giants, Monday, Oct. 22, 2018, in Atlanta. Atlanta Falcons wide receiver Marvin Hall (17) makes a touchdown catch against New York Giants cornerback Janoris Jenkins (20) during the first half of an NFL football game, Monday, Oct. 22, 2018, in Atlanta. New York Giants defensive end Kerry Wynn (72) works to sack Atlanta Falcons quarterback Matt Ryan (2) during the first half of an NFL football game, Monday, Oct. 22, 2018, in Atlanta. Atlanta Falcons kicker Giorgio Tavecchio (4) celebrates his field goal against the New York Giants during the second half of an NFL football game, Monday, Oct. 22, 2018, in Atlanta. New York Giants quarterback Eli Manning (10) runs out of the pocket against the Atlanta Falcons during the second half of an NFL football game, Monday, Oct. 22, 2018, in Atlanta. Atlanta Falcons kicker Giorgio Tavecchio, right, celebrates his 56-yard field goal with Atlanta Falcons punter Matt Bosher during the second half of an NFL football game against the New York Giants, Monday, Oct. 22, 2018, in Atlanta. The Atlanta Falcons won 23-20. Los Angeles Rams running back Todd Gurley (30) scores a touchdown against the San Francisco 49ers during an NFL football game in Santa Clara, Calif., Sunday, Oct. 21, 2018. New England Patriots running back James White (28) carries the ball during an NFL football game against the Chicago Bears Sunday, Oct. 21, 2018, in Chicago. Los Angeles Rams defensive tackle Aaron Donald (99) celebrates during an NFL football game against the San Francisco 49ers in Santa Clara, Calif., Sunday, Oct. 21, 2018. Houston Texans quarterback Deshaun Watson (4) and defensive end J.J. Watt (99) celebrate following an NFL football game against Jacksonville Jaguars, Sunday, Oct. 21, 2018, in Jacksonville, Fla.
Carolina Panthers quarterback Cam Newton kisses the pylon after tripping over it while celebrating a touchdown pass to tight end Greg Olsen during the second half. Chicago Bears running back Tarik Cohen (29) dives to the end zone against New England Patriots cornerback Stephon Gilmore (24) for a touchdown during the second half. Carolina Panthers wide receiver Jarius Wright (13) dives in for a two-point conversion pass from quarterback Cam Newton, not pictured, as Philadelphia Eagles cornerback Avonte Maddox (29) tries to stop him. Indianapolis Colts wide receiver T.Y. Hilton (13) celebrates a touchdown catch against the Buffalo Bills. Kansas City Chiefs running back Kareem Hunt (27) hurdles Cincinnati Bengals free safety Jessie Bates (30) during an NFL regular season game on Sunday, Oct. 18, 2018 in Kansas City, Mo. New York Jets wide receiver Andre Roberts (19) and Minnesota Vikings cornerback Xavier Rhodes (29) fight for control of the all after Roberts loses control of the ball on a punt return during the first half. The ball comes lose as Philadelphia Eagles quarterback Carson Wentz looks to pass against the Carolina Panthers. Houston Texans wide receiver DeAndre Hopkins catches a one-handed pass in front of Jacksonville Jaguars cornerback Jalen Ramsey. Philadelphia Eagles wide receiver Alshon Jeffery (17) is pushed by Carolina Panthers cornerback James Bradberry (24) after catching a touchdown pass from quarterback Carson Wentz, not pictured. Tampa Bay Buccaneers wide receiver DeSean Jackson (11) steps around Cleveland Browns strong safety Damarious Randall (23) on an 11-yard touchdown run. Philadelphia Eagles tight end Zach Ertz, right, makes a catch against Carolina Panthers free safety Mike Adams. Houston Texans wide receiver Will Fuller (15) catches a pass in front of Jacksonville Jaguars cornerback A.J. Bouye (21). Tampa Bay Buccaneers quarterback Jameis Winston (3) dives over Cleveland Browns outside linebacker Jamie Collins (51) on a 14-yard touchdown run. Minnesota Vikings' Adam Thielen (19) catches a touchdown pass in front of New York Jets cornerback Darryl Roberts (27) during the first half. Chicago Bears outside linebacker Khalil Mack (52) warms up prior to an NFL football game against the New England Patriots. Tennessee Titans tight end Luke Stocker (88) celebrates after scoring a touchdown in the last seconds of a game against the Los Angeles Chargers. Tennessee Titans quarterback Marcus Mariota (8) avoids a tackle by Los Angeles Chargers free safety Derwin James (33). Los Angeles Chargers linebacker Denzel Perryman (52) celebrates an interception catch just before halftime against the Tennessee Titans at Wembley Stadium in London. Los Angeles Chargers wide receiver Tyrell Williams (16) celebrates as he scores a touchdown against the Tennessee Titans. Los Angeles Chargers tight end Virgil Green (88) runs out of the tunnel prior to an NFL football game against the Tennessee Titans at Wembley stadium, London. Denver Broncos wide receiver Courtland Sutton (14) pulls in a touchdown pass from teammate wide receiver Emmanuel Sanders during the first half of an NFL football game against the Arizona Cardinals, Thursday, Oct. 18, 2018, in Glendale, Ariz.
Denver Broncos linebacker Von Miller (58) hits Arizona Cardinals quarterback Josh Rosen (3) as he throws during the first half of an NFL football game, Thursday, Oct. 18, 2018, in Glendale, Ariz.
Denver Broncos cornerback Chris Harris (25) high fives linebacker Todd Davis (51) as he scores a touchdown after an interception against the Arizona Cardinals during the first half of an NFL football game, Thursday, Oct. 18, 2018, in Glendale, Ariz.
Former San Francisco 49ers quarterback Joe Montana, left, and former wide receiver Terrell Owens pose for a photo before an NFL football game between the 49ers and the Los Angeles Rams in Santa Clara, Calif., Sunday, Oct. 21, 2018. Los Angeles Rams wide receiver Robert Woods (17) and San Francisco 49ers wide receiver Marquise Goodwin (11) walk onto the field before an NFL football game in Santa Clara, Calif., Sunday, Oct. 21, 2018. Cheerleaders line up before an NFL football game between Tennessee Titans and Los Angeles Chargers at Wembley stadium in London, Sunday, Oct. 21, 2018. Los Angeles Chargers quarterback Philip Rivers (17) joins other players in prayer after an NFL football game against Tennessee Titans at Wembley stadium in London, Sunday, Oct. 21, 2018. Los Angeles Chargers won the match 20-19. Minnesota Vikings wide receiver Adam Thielen (19) dives past New York Jets' Darryl Roberts (27) and Jordan Jenkins (48) during the first half of an NFL football game Sunday, Oct. 21, 2018, in East Rutherford, N.J.
Washington Redskins running back Kapri Bibbs (46) carrels the ball into the end zone for a touchdown as Dallas Cowboys cornerback Byron Jones (31) chases him during the first half of an NFL football game, Sunday, Oct. 21, 2018 in Landover, Md. Kansas City Chiefs quarterback Patrick Mahomes (15) celebrates during an NFL regular season game against the Cincinnati Bengals on Sunday, Oct. 18, 2018 in Kansas City, Mo. Cleveland Browns defensive end Myles Garrett sits on his helmet as the Tampa Bay Buccaneers celebrate their 26-23 win in overtime of an NFL football game Sunday, Oct. 21, 2018, in Tampa, Fla.
Minnesota Vikings running back Latavius Murray (25) celebrates after rushing for a 38-yard touchdown during the second half of an NFL football game against the New York Jets Sunday, Oct. 21, 2018, in East Rutherford, N.J.
Houston Texans free safety Tyrann Mathieu (32) is tackled by Jacksonville Jaguars running back T.J. Yeldon, left, after he intercepted a pass intended for Yeldon during the second half of an NFL football game, Sunday, Oct. 21, 2018, in Jacksonville, Fla.
Cleveland Browns defensive end Emmanuel Ogbah (90) celebrates during an NFL game against the Tampa Bay Buccaneers on Sunday, Oct. 21, 2018, in Tampa, Fla.
Los Angeles Rams running back Todd Gurley II (30) celebrates with guard Rodger Saffold (76) after scoring a touchdown against the San Francisco 49ers during the first half of an NFL football game in Santa Clara, Calif., Sunday, Oct. 21, 2018. Houston Texans free safety Tyrann Mathieu (32), strong safety Kareem Jackson (25), and defensive back Justin Reid (20) celebrate during an NFL football game against Jacksonville Jaguars, Sunday, Oct. 21, 2018, in Jacksonville, Fla.
Tampa Bay Buccaneers wide receiver DeSean Jackson (11) greets Cleveland Browns quarterback Baker Mayfield (6) following an NFL game on Sunday, Oct. 21, 2018, in Tampa, Fla. The Buccaneers beat the Browns in overtime. Tampa Bay Buccaneers players celebrate their 26-23 overtime win against the Cleveland Browns during an NFL football game Sunday, Oct. 21, 2018, in Tampa, Fla.
New England Patriots wide receiver Julian Edelman (11) is upended by Chicago Bears strong safety Adrian Amos (38) during an NFL football game on Sunday, Oct. 21, 2018, in Chicago.